When you are looking for a tabletop game to invest in, you have a few choices available. Right off the bat, some of the most common options are billiards, table tennis, air hockey, and foosball. Of these options, there are a few reasons why we would argue that foosball is the most convenient one. For example, foosball is easy to play with groups thanks to the layout. Depending on the size of the table, you can play with a maximum of anywhere from four to eight players. This makes it easier to play foosball with your friends than it would be with any of the other table game options, especially larger groups. Another reason why foosball is a great option is that it doesn't require as much practice to be proficient. This does not mean that foosball doesn't need skill, but it is not quite as tricky as table tennis, pool, or any of the other options that are nearly impossible to compete in unless you have played before. 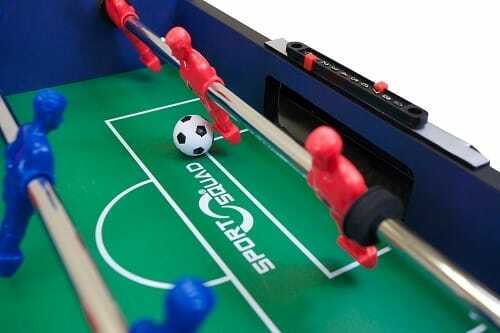 Foosball is also relatively affordable when compared to the other choices. Foosball is more accessible thanks to the simple nature of the game table when compared to something like air hockey, which requires a much more complicated table. The only game which rivals foosball concerning affordability is ping pong. After all of these positive aspects, you must be wondering where the catch lies, but there are not too many downsides to foosball when it is compared to competing table games. While it may be a little more challenging to set up a foosball table, this is not a significant issue, and it is one which is shared with air hockey. Before we move on to our review of one of our favorite compact air hockey tables, we are going to take a look at a characteristic which is integral to some of the best air hockey tables on the market. It is crucial to account for the size of your foosball table when you are making your purchase for a variety of reasons. One of the reasons why you will want to consider the size of your foosball table is that it will be one of the single most significant influences on the price, so the size of your table will influence your budget. There are more reasons why you will want to consider the size of your table aside from the price, however. The gameplay on a more substantial table will be somewhat different when it is compared to a smaller model. You will find that entire rows of players may sometimes be omitted in downsized tables. A smaller table will also be easier to set up as you will have fewer parts to assemble when it first arrives. The size of your table will also affect the number of spots that you will be able to place your table. A smaller table will be able to fit into smaller spots, so you will not have to struggle to find space in your game room. If a foosball table is larger, you will also have more difficulty putting it away when the time comes to store it. The key is to find the best compromise between size and convenience. There are so many reasons why this is the best option that you will come across if you are looking for a compact foosball table. For example, the protective cushion on the underside means that you will be able to play on any surface when you are using this foosball table. Chrome-plated steel rods keep your shots smooth and powerful, which allows for surprisingly fast-paced games for such a small table. While some players are not fans of the three-player goalie layout, you will find that it is ideal for keeping the ball from getting stuck in the corners. The decision to include two balls means that you can keep playing if you lose one, but you may wish to purchase extra ones if that is a relatively common occurrence for you. While this table may be small, it is designed to feature excellent build quality so your games will still be enjoyable. Let’s look over some of the more pertinent customer reviews for this foosball table. Most customers were impressed by how durable this table is for a compact model. 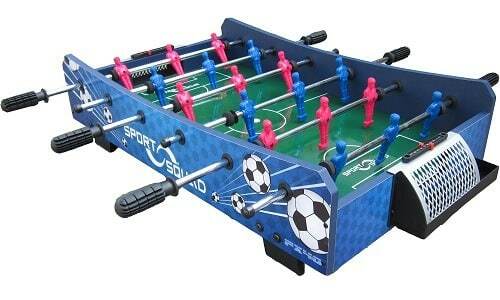 This foosball table was also praised for its ease of assembly which allows you to start playing as soon as it arrives. You may be wondering if there are any downsides to this product. Of course, there are the usual issues that are associated with a compact foosball table like a smaller playing area, but that is not a problem as much as it is a compromise. If you are looking for an affordable way to get into foosball, this may just be your best option. While professional tables can cost up to 1000 dollars, this product is available for less than a tenth of that. If you want to purchase one of these tables on Amazon, you can get it for around 75 dollars. This is one of the best compact foosball tables that we have ever reviewed so don’t miss out if that is what you are looking for. Thank you for taking the time to read our review and feel free to let us know what you think in the comments down below.